Working on 1 cupcake at a time, spread some of the chocolate frosting on top of a cupcake, mounding slightly. 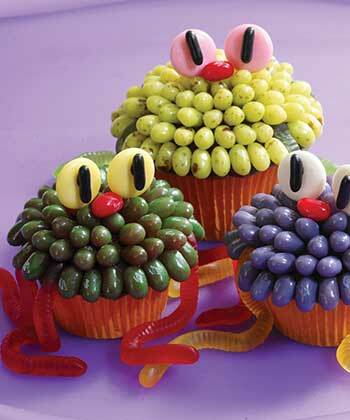 Arrange like-colored Jelly Belly jelly beans all around the outer edge of the cupcake lengthwise from center to outer edge. Place another row of jelly beans, slightly overlapping the first row. Continue adding rows of Jelly Belly jelly beans until it is covered. Remove 4 of the jelly beans along the outer edge and in their place add 4 Sour Neon Inchworms as legs. Add a dot of chocolate frosting to secure if necessary. Pipe dots of frosting and attach the Mint Creme eyes and red jelly bean nose on top of the cupcake. Repeat with the other cupcakes, jelly beans and frosting.